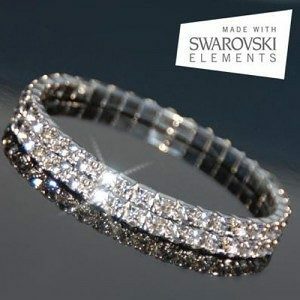 Swarovski Elements Double-Tiered Austrian Crystal Bracelet Only $3.99 Plus FREE Shipping! You are here: Home / Great Deals / Swarovski Elements Double-Tiered Austrian Crystal Bracelet Only $3.99 Plus FREE Shipping! Need a little bling this almost spring? This Swarovski Elements Double-Tiered Austrian Crystal Bracelet for Only $3.99 Plus FREE Shipping will make a stunning compliment to any outfit. The Austrian crystals will bring out a simple shine that adds just the right amount of bling!